Last summer I fell in love with Winslow Homer’s watercolours so I thought now is the right time to finally write about them. Winslow Homer (1836-1910) was an American painter from the East coast, famous for his Realist style landscapes and scenes of turbulent blue seas. He started his artistic career by studying lithography for two years, and he made illustrations for magazines such as Harper’s Weekly but this didn’t stop him from pursuing his dream of being a real artist and he made a successful transition from illustrator to oil-on-canvas painter. In 1859 he moved from Massachusetts where he lived with his family to New York City where he opened a studio and started taking classes at the National Academy of Design. He first started using the medium of watercolours in 1873 and he was instantly good at it; he successfully sailed the seas of watercolours. His mother was an amateur water-colourist so it is possible she inspired him to take up watercolours, since the two were close throughout his life. 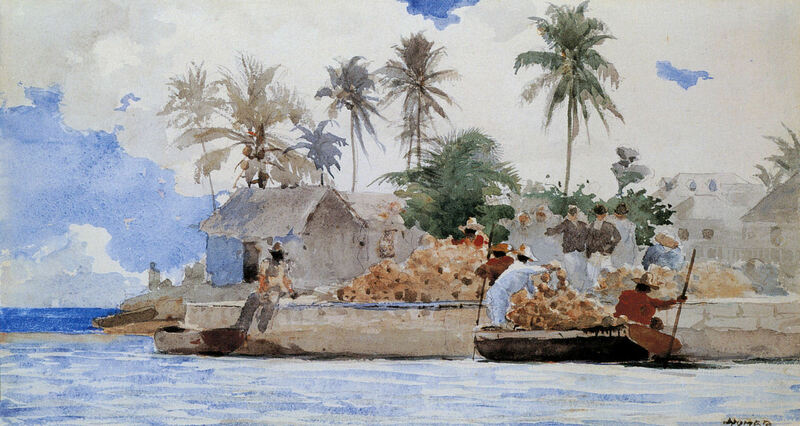 In this post we’ll take a look at Homer’s watercolours that capture the beauty of the south and the mythical tropical lands that are perpetually so dazzling to the imagination of the Western people; a place where rains don’t fall down hard and sad, the sky isn’t a monotonous grey, a place where pink and golden sunsets play Apollonian melodies and love lingers in the air; the Caribbean. Homer was nor the first nor the last Western artist to take inspiration in lands that were exotic to them; Albrecht Durer travelled to Italy, Delacroix’s travels to Morocco changed his colour palette and brought a whole new set of subjects, Paul Gauguin’s well-known Odyssey to Tahiti resulted in many vibrantly coloured canvases. And what an experience it must have been for Homer who was so used to the grey sky and green meadows to come to a world of sunshine, light breeze and glistening blue ocean, inviting and warm. 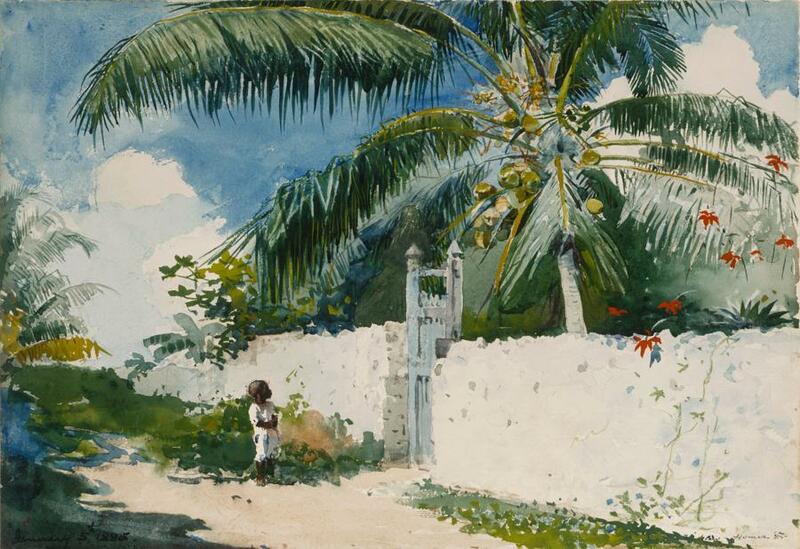 Homer travelled to Florida, Cuba and the Bahamas in winter of 1884-85 to paint the tropical heaven scenes commissioned by the Century Magazine. “Sponge Fisherman” has such a meditative vibe, perhaps it’s because of the horizontal composition, or the dreamy way in which the sky and the ocean meet, both so serene and blue. Even though the painting shows workers and it’s probably very hot, something about it makes me so relaxed. The palm trees here look as if they are carried by a gentle breeze and the workers seem bubbling and chatty, not exhausted or sad. The sponges in this painting reminded me of something from Márquez’s novella “The Incredible and Sad Tale of Innocent Eréndira and her Heartless Grandmother” which I was just reading. In one scene the grandmother is talking in her sleep and she mentions sailors from foreign lands who brought sponges that were alive and crying and made children in the house cry just so they could drink in their tears! Ha ha. That wonderful magic realism. “Along the Road” is a rather interesting example because we have a human figure again; a dark-skinned beauty dressed in white walking down the street. it seems to me that she is holding her headdress with her hand so the wind doesn’t blow it off. Behind her we see a row of houses and the ocean is glistening in the distance. 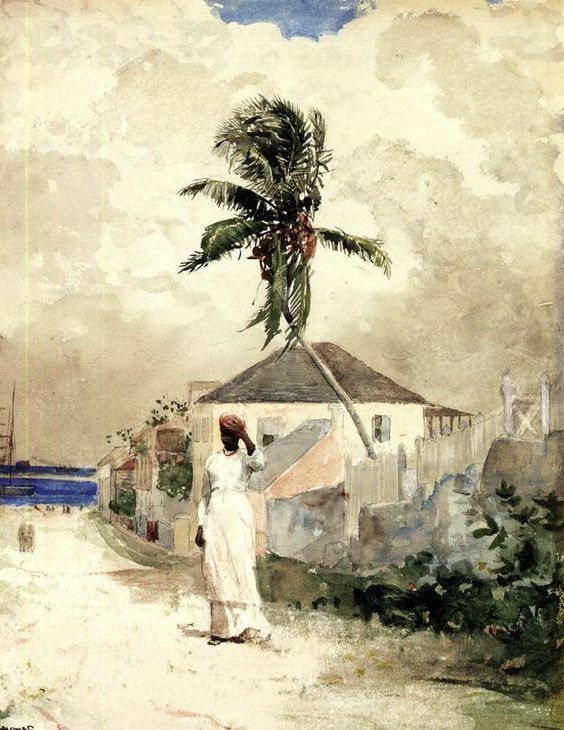 The palm tree swaying its branches wildly and the sky both indicate the weather condition of strong winds and an approaching storm possibly. I hope this lady got home before rain. Homer managed to create a sense of depth in the sky and the rest of the painting despite using a limited colour palette of greys and muted tones. The two paintings above both show gardens in Nassau and here Homer had wonderfully achieved the mood of a hot summer day. Many and many shades of green and blue seem to be playing a sonata in “A Garden in Nassau”. The tree looks ever so grandiose with those large leaves painted in intensely vibrant shades of green. A little boy stands in front of the gates and a tall white stone wall. Half-frightened, half-curious. The little red flowers in the right part giggle with curiosity as he bows his head down. The palm tree is silent, casts its shadow in the midday heat instead of a respond. Its leaves don’t sway, for the wind is having a siesta. 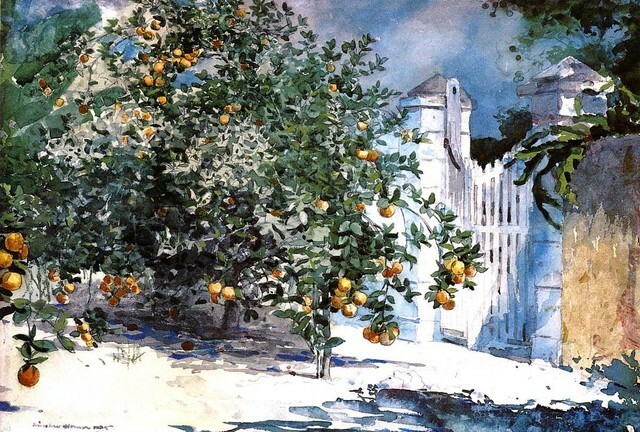 In the painting “Orange Trees and Gate” it is the orange tree which got Homer’s spotlight. Again, everything is so luminous and bathed in lightness. Thousand little brushstrokes of green colour make an orange tree and dots of orange stand for the fruit which weighs the tree down. Ground is left in white but a sad dark shade of blue is coming from the lower right corner, from the space unknown to us. Two paintings above, “Shark Fishing” and “After the Hurricane” shows us that Homer didn’t just capture the idealised notion of the Caribbean world and presented it as a world of sunshine and magic, as Gauguin had perhaps done in his Tahiti paintings. Homer didn’t hesitate to paint the everyday reality and people doing what they normally would, whether it’s a brave and dangerous act of fishing a shark, or capturing the sad reality of the fragile Caribbean world after the hurricane. Notice again what a virtuoso he is with watercolours, how gracefully he painted the transitions of colours, how he created a dynamic mood; that threatening dark cloudy sky, that unforgiving sea, the blades of grass so thin and vibrant, and the figure of a man washed up on the shore, a poignant focus of a painting that we can all empathise with. Nature is interesting, yet wild. As you may have noticed by the dates, some of the watercolours were made a decade later, in 1899, and not in 1885. It’s because Homer visited Florida and Nassau again in winter and stayed there from December 1898 to February 1899. 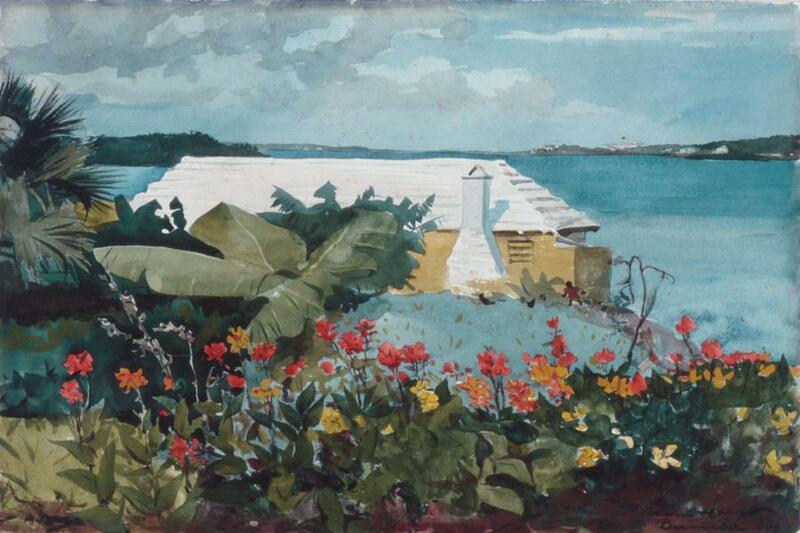 His very colourful and vibrant watercolour “Flower Garden and Bungalow” was also painted during that trip. I didn’t even notice the bungalow at first because my eyes were so captivated by the sea of tropical red and yellow flowers in the foreground. And the view of the dreamy blue sea in the background is just mesmerising. My infatuation with the Caribbean and Latin America started last summer when I read Gabriel Garcia Márquez’s novel “One Hundred Years of Solitude” which I thought was absolutely fabulous and I intend to reread it this summer. 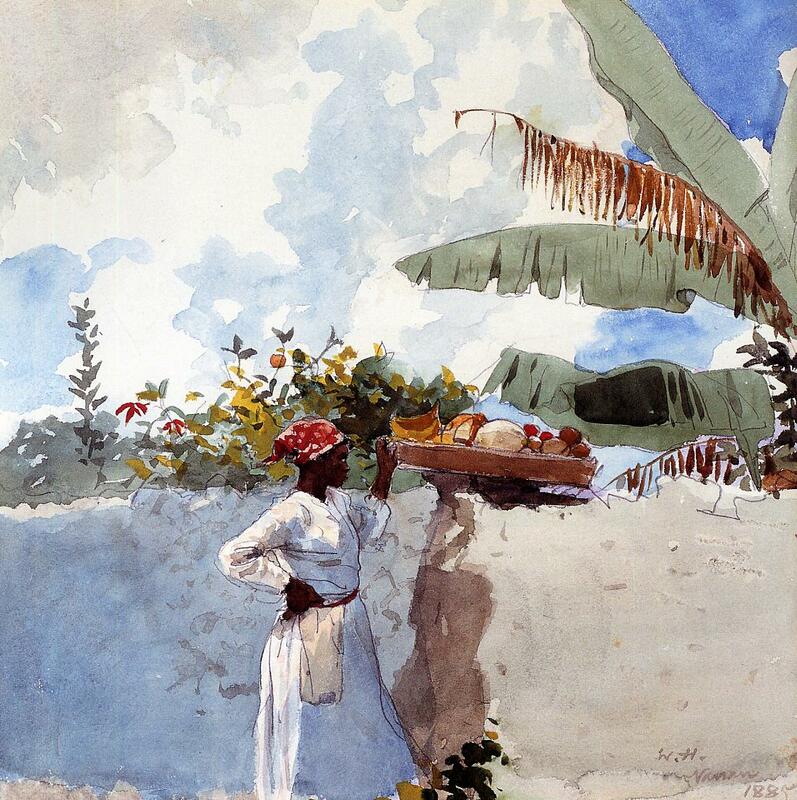 To feed my Caribbean infatuation I read poems by Cuban authors, Latin American writers, Reinaldo Arenas, listened to Omara Portuondo and Agustin Barrios, gazed at Frida Kahlo’s paintings, and so when I discovered these gorgeous watercolours by Winslow Homer it was love at first sight. This is how I imagine the sea when Reinaldo Arenas writes about it in his memoir “Before Night Falls”. Sandy beaches, pink skies, a breeze through the palm trees, rare birds with colourful feathers, a world of exoticism and vibrancy comes to mind when I gaze at these watercolours and daydream of the Caribbean islands and seas. Sargent’s Carnation, Lily, Lily, Rose is one exceedingly beautiful, vivacious and dreamy painting set in a resplendent garden covered with a flimsy veil of purple dusk in late summer, August perhaps, when nature is at its most vulnerable and autumn creeps in bringing chill evenings and morning mists, and starts adorning the landscape with a melancholic beauty. 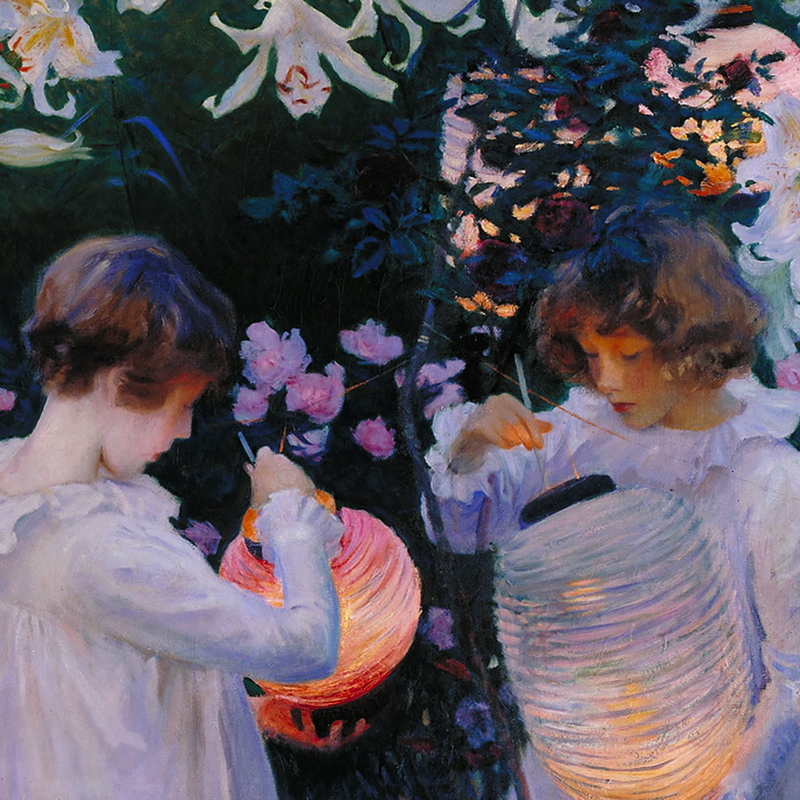 Two little girls dressed in white gowns are playing with Chinese lanterns in this magical “secret” garden where lilies, carnations and roses appear enlivened by the nocturnal air and soft caresses of twilight. Gentle blades of grass seem to dance in the sweet, but fleeting melody of the dusk. White lilies laugh, their whiteness overpowering the shine of the lanterns, and relish in throwing mischievous glances around the garden, spreading gossips. Pink roses that spent their days in daydreams, have now awoken, keen not to miss all the fun that the night has to offer. Pretty yellow carnations, with thousands of little petals, each adorned with a divine perfume, are naughty little things. Girls’ white dresses, glistening in pink overtones from the dusky light, flutter in the evening breeze. Very soon, a game will begin; a game in which lanterns and moonbeams will be competing in beauty and splendour… As dusk turns into night, the lights of the moon will colour the garden in silver, secrets and dreams… When all is quiet and children are asleep, the flowers and the moon will converse. If you’re eager to know the mysteries of their language I suggest you to follow the trail of rose petals and silver all the way to one of the famous opium dens in Victorian era Limehouse, and once there, lie on the soft oriental cushions that glisten in dim lights and smokes arising and dancing in the tepid air, and wait for Morpheus to visit your soul in a slumber, for we all know that the poppy seeds never lie. This painting is not only aesthetically pleasing, but it also reminds me of all sorts of things; first on the magical garden in the film Coraline (2009) where flowers are alive and naughty, and cat talks, then to the film Secret Garden (1993) which is based on book I’ve not yet read, and also on Syd Barrett and the lyrics to some of his song;”Flaming” and “Wined and Dined”. This is just an utterly beautiful and dreamy painting, but its technical aspects are equally interesting. First of all, the details and the very fine brushwork are amazing, and they irresistibly remind us of Pre-Raphaelites, and we know from the letters that Sargent was obsessed with them since the autumn of 1883, which he spent in Sienna. The inspiration for the painting comes not from pure imagination but from a real event; one evening, in September 1885, he was sailing on a boat down the Thames with a friend and he saw Chinese lanterns glowing among trees and lilies. That special velvety pink-purplish dusky colour palette was achieved by directly gazing at nature in dusk, which meant it took him an awful lot of time to actually finish the painting. It was painted “en plein air” or “outdoors” which was typical for the Impressionists but uncommon for Sargent. 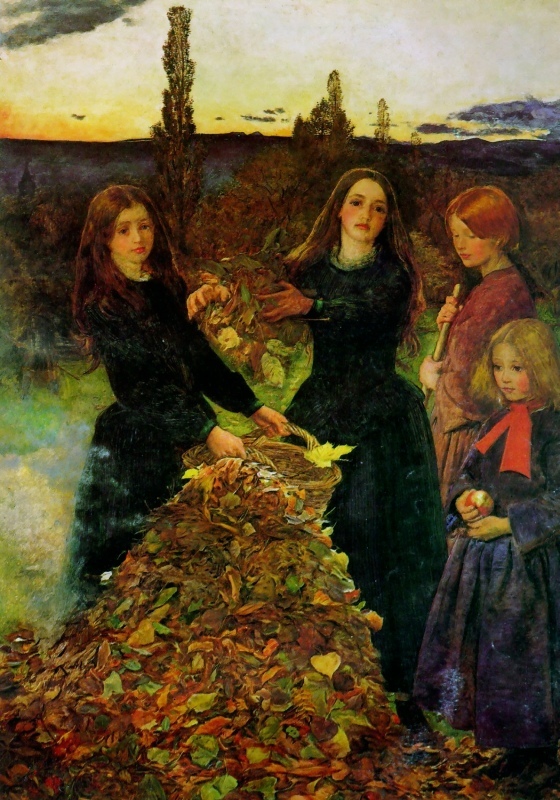 He painted it in two stages; first from September to early November of 1885, and then in the late summer of 1886, and finished it sometime in October 1886. He spent only a few minutes painting each evening, at dusk, capturing its purplish glow, and then continue the next evening. 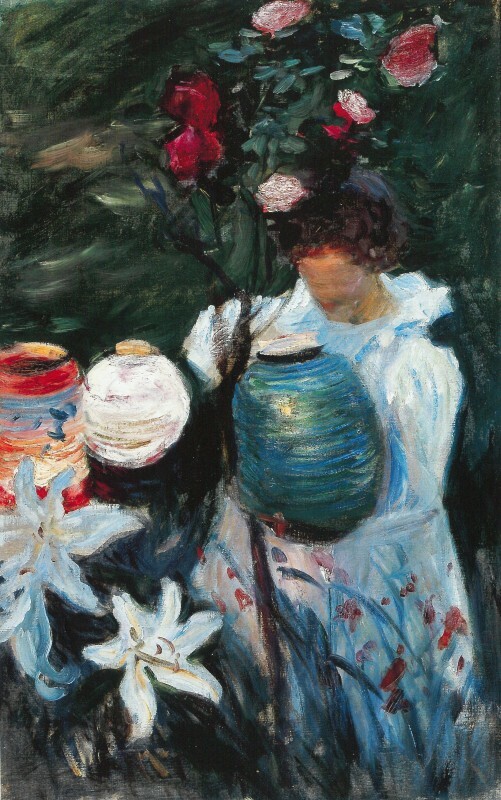 He found the process of painting difficult, writing to his sister Emily: “Impossible brilliant colours of flowers and lamps and brightest green lawn background. Paints are not bright enough, & then the effect only lasts ten minutes.” And when autumn came, he would use fake flowers instead of real ones. 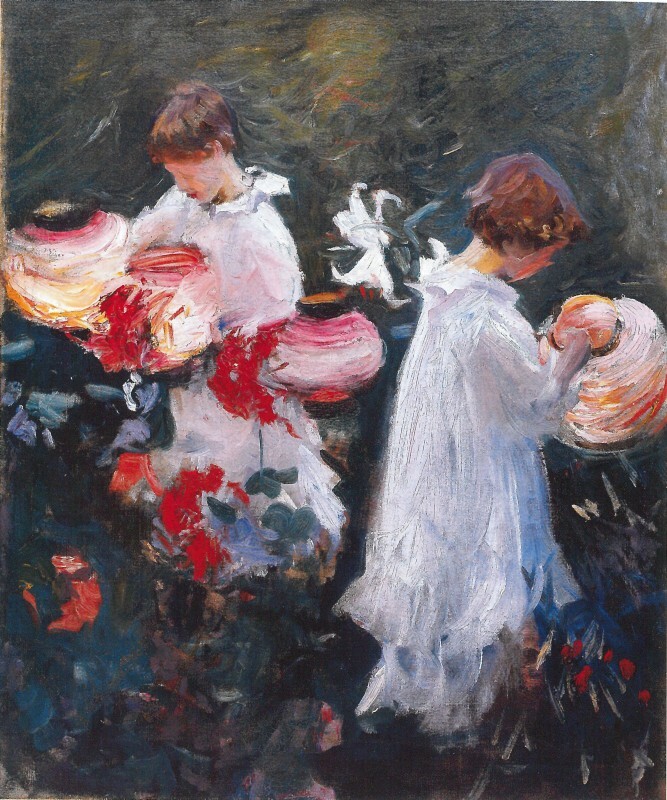 Two girls in the paintings are the 11-year old Dolly on the left, and her sister Polly, seven years old at the time; daughters of Sargent’s friend and an illustrator Frederick Barnard. They were chosen because of their hair colour. The original model was a 5-year old dark-haired Katherine, daughter of the painter Francis David Millet, and she was allegedly very upset that Sargent had replaced her. Poor girl! Also, the lovely title of the paintings comes from the refrain of the song “Ye Shepherds Tell Me” by Joseph Mazzinghi. 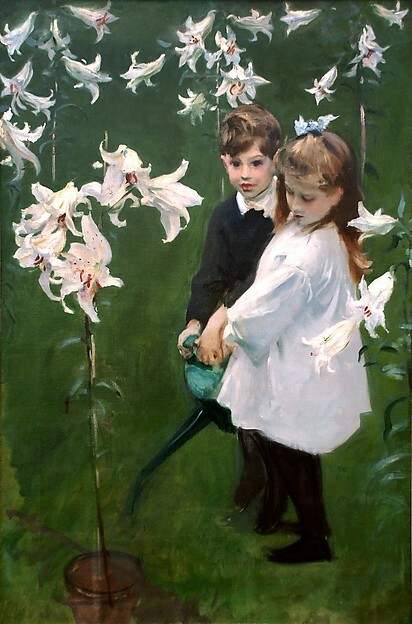 “Garden Study of the Vickers Children” is a some kind of a draught, a rehearsal for “Carnation, Lily, Lily, Rose”; both paintings were painted en plein air and both show children in a garden; childhood innocence was a theme often exploited in the arts of the 19th century because it appealed to the Victorian sentiments immensely, and both show the influence of the Pre-Raphaelites. However, in “Vickers Children” he uses bolder brushstrokes and the colour palette is all but magical; dull white, green and black. 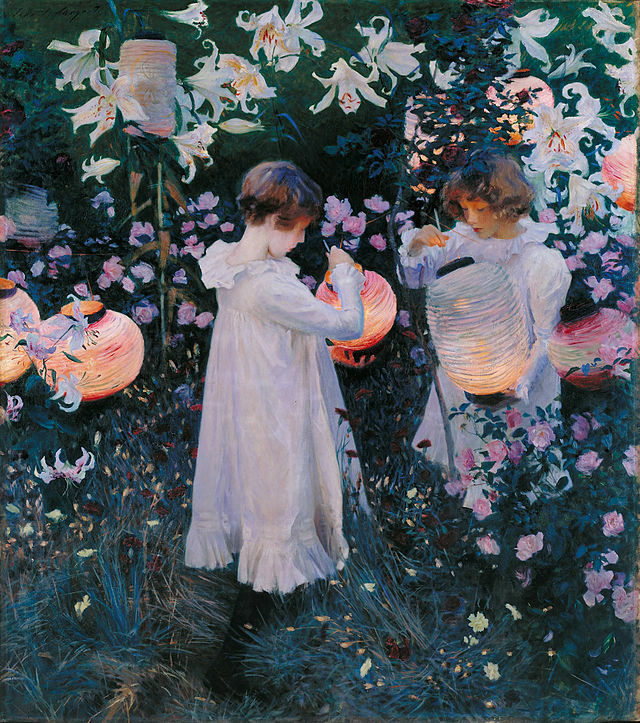 Sargent is said to have made more studies for “Carnation, Lily, Lily, Rose” than he did for any other of his paintings. Some of these studies you can see here, and they are simply gorgeous, they have such ardour and liveliness and there’s a real magic coming from those quick, visible brushstrokes; look at those lanterns, shaped in swift, round strokes of warm magical colours, and quick ones for the blades of grass and tints of rich red for flowers, ah…. This is the beauty that Dante must have had in mind when he said “Beauty awakens the soul to act.” These paintings awaken my soul! Here you can listen a composition by Meilyr Jones inspired by this painting. Can you spare a second to think just how exciting it is to make a composition inspired by a painting, and such a beautiful painting?! And there a nightingale is loud. She sings of love, love only . . .
And girls who are now innocent children will became adults, insensitive towards the beauty they once gleefully inhabited. The very first glance at Sargent’s painting reminded me of this sentence from the book “Syd Barrett and Pink Floyd: Dark Globe”: “‘Wined and Dined’ has an undertow of sadness, sung in the most fragile of voices, lingering in twilight at an August garden party he never wanted to leave.” That beautiful, sad and poignant song dates from Syd’s days in Cambridge, when he was a happy man and life was idyllic, all “white lace and promises”, just like in the song of The Carpenters. This magical garden scene where flowers giggle, gossip and chatter in the purple veil of dusk, and lanterns glow ever so brightly is what I imagine Syd was in his mind; the August party he never wanted to leave… Thinking about it always makes me cry, it is so very sad. That “undertow of sadness”, this gentle fleetingness of the moment is exactly what I see in “Carnation, Lily, Lily, Rose” and in all of Syd’s songs. Move the flimsy veil from beauty, melancholy thou shall find. They are things which are so intensely beautiful that I am not sure whether they produce as much pleasure as pain. They fill the heart with delight and longings all at once – such is the effect this painting has on me; first it lures me, and then it saddens me… But hush now, hush, reality, and let me enjoy the sweetness of this magical garden for another moment… Oh yes, I can feel the softness of the grass, see the lights of the lanterns, smell the carnations, can you? The colours and the mood of this painting instantly attracted me. 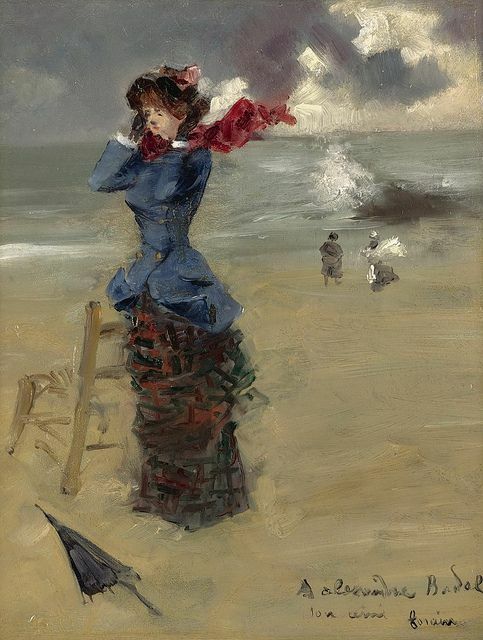 An elegant lady is trying to leave the beach as quick as possible, to avoid the upcoming storm, but the wind is not making it easy for her. Exuding sophistication and class, she must be a Parisian lady who came to the seaside on holiday, hoping to find some peace from the stresses of modern life. Instead of enjoying a picturesque sunny day at the beach, with smiling white clouds and a clear blue sky, she’s welcomed by a turbulent sea and an overcast day, oh how aggravating! Let’s imagine her name is Celestine, and that this is a one of those sudden storms at the height of Summer, let’s imagine it’s one Thursday afternoon in July. So, Celestine is in a hurry, because she knows that even cheap dreams don’t stop the rain. It seems that just a second ago she lifted her arms and dropped her umbrella, quick not to allow the wind to take over her lovely bonnet. We can see the direction the wind is blowing because the ends of her coat are turned upwards and her red scarf, painted in just few dabs of rich cherry colour, is dancing on the wind. Her vibrant garnet red dress and a navy blue coat stand out amidst all that greyness, which irresistibly reminds me of Anna Karina’s blue and red outfits against the backdrop of grey Parisian streets in Godard’s film ‘Une Femme est Une Femme’. Swift, thick and short brushstrokes are present everywhere, but most notably on her skirt, where the black and red seem to be battling for dominance over the fabric. I’m sure Celestine would like me to talk more about that lovely outfit that she put together for a walk at the beach, but I think the sea and the beach itself deserve a moment of attention and appreciation. As Forain was an Impressionist, and a friend of Manet and Degas who even invited him to exhibit on the Impressionist exhibitions, he wanted to capture the mood, the magic effects of light and air, rather than perfect details and realistic portrayal of landscape. His careless brushwork and the illusion that everything was painted hastily, as a sketch, all bring to life the atmosphere of that gloomy afternoon: we witness the white clouds being devoured by the dark-grey ones, with almost a purplish undertone to them, we see the wind as it tries to blow Celestine’s bonnet, and probably carries the tiny particles of sand in her eyes, and the sea – we can hear the clasps of waves, and see their strength, beauty and naughty playfulness. This is a moment captured in time, like a photograph. And do I sense a spirit of Turner or Whistler in that portrayal of sea? It’s hard to notice the line which separates the sandy beach and the sea, but this vagueness delights me. There’s a chair next to the lady, also painted in quick brushstrokes, and two small figures in the background. Sea is painted in beautiful sea foam colour. All in all, the beauty of this painting, for me, lies in its quick, exciting, playful brushstrokes and a gorgeous colour palette in which harmony of greys meets the vibrancy of reds and blues. Rain, storm, and a desolate beach – my idea of heaven, or at least a perfect afternoon.